A medieval knight leads a quest through Hell to recover the Holy Grail from the Devil. The knight, Marco da Roma, is joined by: Giovanni Boccaccio, an expert on Dante; William of Ockham, an English friar; and Nadja, an epileptic with the gift of prophecy. As the Black Death sweeps through Europe, these unlikely heroes confront the Devil–and their own demons–to forestall the Apocalypse. If you’re a fan of George R.R. Martin and J.R.R. Tolkien, you’ll love Devil’s Lair. Imaginative Wandering Tale with a mysterious knight, a storyteller, a disbarred monk and a vulnerable woman brought together by fate. 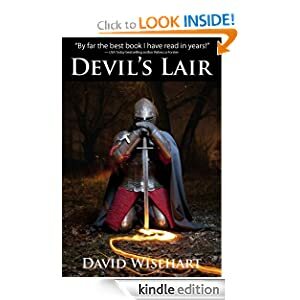 Reminiscent of epic tales of old such as Gilgamesh and Hercules, sent on a quest to find something, David Wisehart brings together a band of misfits on the search for the Holy Grail. At first the Knight de Roma reads like a hero of old, surviving insurmountable odds, you begin to wonder if he is even human. Each character is brought to the forefront for their own sad, sorry tale, ending in a sort of reclamation. Wisehart creates such beautiful, haunting backgrounds, in both character and setting, it is impossible to tell where a character begins and a setting ends. The desolation from war, lack of water and endless wandering shows us the length some will go. Wisehart brings psychological and emotional fights that we, the readers, can relate with. We’ve all been through the same sort of pain and Wisehart shows us we, like the characters, can get through anything. Thoroughly enjoyable tale I would give 5 stars.